College students and alumni are notoriously loyal to their alma mater schools. In any college town there are labels, logos, mascots, decals, flags, and clothing that all promotes the hometown favorite. And for far-flung alumni, newsletters and emails help keep attention focused on the college and promote logo-bearing products. And there is no better way for a sleep-deprived college student (and alumni) to show their school pride than with a coffee machine labeled with their alma mater’s logo. 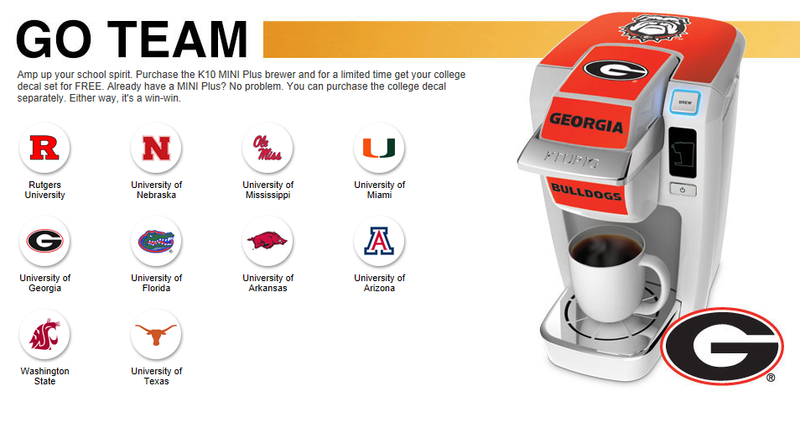 Green Mountain Coffee Roasters is now selling a version of its Keurig K-Cup Mini Plus brewers decorated with the logos of 10 different Division 1 colleges. The new coffee brewers are also available in multiple colors for those whose college decals are not yet available. And, if a customer already has a brewer and wants just a logo, they can be purchased separately. It’s a great way to promote school pride along with solidifying the coffee-drinking habits of students and alumni alike. Divide students into teams and have each team develop a profile for the target market. Include demographics, psychographics, behaviors, values, and attitudes. Based on the profile, what makes this product unique for these customers. Debrief the exercise and discuss how the elements could apply to additional target markets.